Red rose campion – wild flower. Largely grows itself, but is a superb burst of colour and should be good for moths. It does flop as it finishes its first flowering, so either cut it back or pull it out at this point. Cornflower – blue. A hardy annual which you can start in the autumn – as these were – or grow in the Spring: they grow very fast and very easily from seed. Some butterflies will nectar on them. The haze of bluish-purple is catmint. Superb for bees, as well as cats. 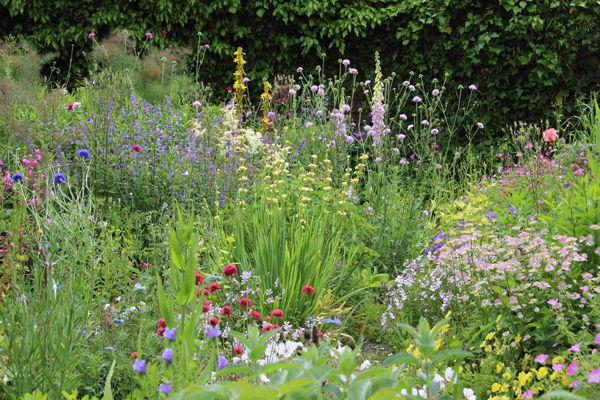 Keep it tidy by cutting back after the first flowering, and you’ll get a second lot. The yellow thing sticking up is asphodeline. I’ve been waiting two years for this to bloom, and I don’t think I like it! Oh well, you win some and you lose some. The white haze is a garden variety of the wild flower called meadowsweet. Seems to attract the smaller flying insects. The blobs of mauve are knautia macedonica – they come in various pastel shades plus deep red. A scabious-type flower, which butterflies will use, then the birds will nibble at the seedheads: as these are on long, slender stems, the birds (usually goldfinches) sway around a lot. Foxglove. I let these self seed then move them to where I want them – except for the ones I miss. One of the best flowers for some of the bees, and it’s fascinating to watch the bees disappear up inside the tubes. The blue/purple of which you can see a little is a hardy geranium, which is covered in flower. Good for smaller flying insects. The large pink blob is an Oriental poppy. I’ve tried to dig up this particular clump three times now, but it keeps coming back. I do like them, but I these were some I was given that were grown from seed and I ended up with three different colours growing together and clashing like mad. Bees and many other insects will use them, getting covered in pollen in the process, to the point where the insects even appear to have changed colour. Bright pink hardy geranium ‘Claridge Druce’. A thug, though a pretty one; the white butterflies nectar on it, and bees use it. Yellow viola ‘Glenholme’. One of my perennial violas. Not a fantastic insect plant, but no trouble and flowers for months. The pale pink mound is astrantia. I’ve only just got these going – they are certainly good for bees, so I await the arrival of more butterflies with interest to see what they think of it. Pale mauve viola ‘Maiden’s Blush’ – another perennial, with daintier flowers. The tall yellow spikes are sisyrinchium. Not sure how it got here, but I like it. Will watch it to see how the wildlife use it. The white flowers you can just glimpse are hardy geranium ‘Kashmir White’. Not sure of its wildlife use. Tall bright pinky/red flowers – these are a type of thrift (armeria). Thrift is generally good for bees, but I haven’t noticed anything on this yet – it’s a very different colour to the pale pink of the wild flower. The blue blobs are echium ‘Blue bedder’. This is a garden variety of the viper’s bugloss, which is wonderful for bees; I’ve only just planted these out (they are easy to grow from seed) so I’ve yet to see how they perform. 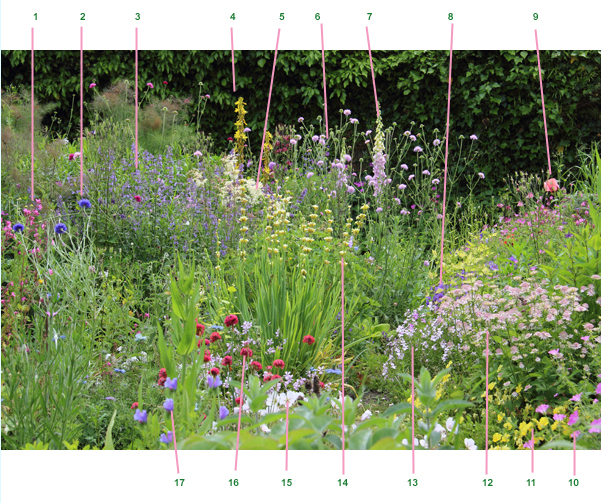 So there you are – 17 flowers, many good for wildlife. I’ve only talked about their potential as nectar plants above, but some will also work as foodplants for butterfly and moth caterpillars – but that’s another post. What’s the difference between a garden plant and a wildflower? Our passion for putting labels on things leads to some rather odd distinctions: “plants” and “weeds”, “friends” and “foes” when we’re talking about insects, and “garden plants” versus “wildflowers”. In the last case, if you think about it, every plant is the offspring of a wild flower at some point in history – unless they were brought here by aliens, but dandelion delivery by UFO doesn’t really work for me. Garden plants, as we label them, have been bred with the gardener in mind, which does not always suit wildlife – the trend towards double rather than single flowers, for example, often means insects cannot get to the nectar-producing part of the plant. There is some argument that nectar is nectar and many garden plants are as good as wildflowers, but when it comes to providing food for caterpillars, many butterflies and moths have developed to eat very specific plants over the millennia and may not be able to change their allegiance easily. My basic rule of thumb is that you can’t go wrong with wildflowers, whereas garden plants can vary considerably in their use to wildlife. One of the plants you’ve probably got most of in your garden because someone put it there is the rye grass that makes up a lot of lawns, and it is pretty useless for insects. 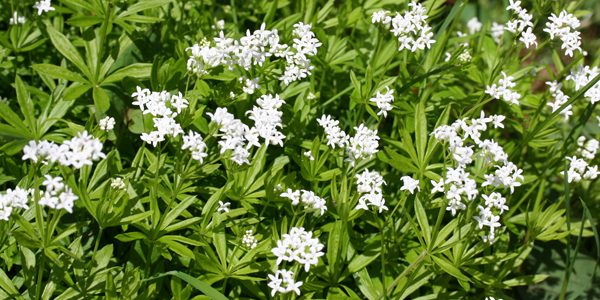 We tend not to see much in-depth information on growing wild flowers – an author might exhort you to grow devil’s-bit scabious or sweet woodruff, but they give no detail of the soil or position the plant likes. I constantly find myself turing to two sources: the “Wild flower specification manual” from Really Wild Flowers, and the “National Trust Book of Wildflower Gardening” by John Stevens for this detailed information. Really Wild Flowers are a company who specialise in growing wild flowers for sale, and their “Wild flower specification manual” is available as a free download: go to www.reallywildflowers.co.uk and then go to the advice section and find the downloads, where you will also find documents on butterfly food/nectar plants and on plants generally good for insects. The National Trust book is now out of print, but available very cheaply via Amazon. One of the great things about wildflowers is they often prefer to grow in places where you roses and dahlias would struggle to put on a show, so they can be good for you as a gardener as well as the wildlife in your garden – try some.